Prepare your installation for the future. In terms of flexibility, safety, and efficiency, decentralized room automation already sets the standard. With the modular and extremely flexible system gesis® FLEX Wieland Electric provides a TOP solution for the control of sunblinds, shading, lighting, heating, cooling, ventilation, integration of buttons, and many more requirements in room and building automation. The consistent use of the standardizes systems KNX, EnOcean, DALI and SMI for the compact and entirely pluggable devices increases the profitability and sustainability of any property. The flexible busbar gesis® NRG functions as central supply line for efficient installations. The contact is through an insulation-penetrating connection technology. Five systems with different cross sections are available – regardless of whether you want to distribute power or signals. The gesis® NRG flat cable system offers all the advantages of a modern electrical installation system. Once the cable is outspread, we can connect the distribution modules without having to sectioning the cable. Expansions or modification of the electrical installations can be done in a very little time with a great money saving. The connection to the conductor is done by specific screws that drill the cable. gesis® MICRO makes the electrical installation invisible. Because is so small, all you need is a drilled hole to run the lines through. The gesis® MICRO connector system connects your light showcases and on shelves in places where no one else can reach. And it does so in the simplest way imaginable. Because gesis® MICRO comes as a pre-assembled cable, you do not have to connect the plugs manually, it is all Plug&Play. This makes the electrical installation inside your furniture invisible from the outside, so that nothing distracts the eye from the things that matter. The MINI version of gesis® system is nearly the same has the GST18 series but with a compact design: pluggable electrical installation specially developed for confined spaces. gesis® MINI meets both demands and combines minimum size with maximum flexibility.Thereby, this is the preferred system for stores, event tents and exhibitions, where a fast and flexible electrical installation is mandatory. Plug and play – everything can be connected! A breakthrough idea has emerged at Wieland which revolutionizes electrical installation: the gesis® installation system. Highest-grade quality and long-lasting components along with a convincing 70% time and 30% cost savings! The individual gesis® product groups complement each other perfectly and facilitate a simple and economical electrical installation, from distribution panels up to the load. The miniature connector for LED lamps and signals. The RST®MICRO is optimized for the interfaces between voltage or current sources and LED modules, and is also the ideal solution for dimming or DMX applications. Thanks to it’s rated values, network applications are no problem either. The RST®MICRO installation system comprises connectors, M14 device connectors, pre-assembled conductors and splitters. Requiring increased protection of electrical installations from environmental conditions are found everywhere. Experience and competence in designing and installing the electrical system always plays a decisive role, but especially in this area. Difficult installation conditions and increased time pressure often lead to mistakes, loss of the environmental protection, and ultimately to failure of the system. With just a few basic components, including connectors, panel-mount connectors, distribution units and cable assemblies, complex installations from the distribution panel up to each point of demand can be accomplished. This saves time and costs. With the round connector system gesis® IP+, Wieland Electric offers the perfect solution for your photovoltaic system. Whether on the AC side with the product line RST®, or the DC side with the product line PST®, solar systems are installed quickly and without error. The result is clear savings in time and costs. Pre-assembled components with an increased degree of protection ensure a quick and safe installation even under the most adverse conditions. The system includes distribution panels which are delivered in a pre-assembled design, and cable assemblies for the connection between the inverters and the distribution panels. The system is supplemented by connectors for assembly on site. Leading inverter manufacturers already preassemble their devices in the factory, with the relevant RST® connectors to interface the system. Smallest pluggable installation connector with highest IP rating, optimized for installation in confined spaces. The new RST® MINI series marks a continuation of the story of the RST® installation system’s success and logically follows the trend towards compact designs. 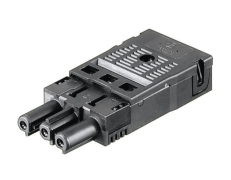 The 2 to 5 pole plug connectors and device connectors have been designed for 250/400V and 16A and are all available in the screw connection technology that electricians trust. Customized distributors as well as pre-assembled cables round the system off perfectly and offer a huge range of different possible uses, not just in building automation or industry.